Cricket Battles | international cricket | captain | Test-playing. The folklore of cricket comprises some intensely fought battles, on and in some cases, off the field. The 1977-78 Australian season was one such. It witnessed a titanic tussle on the field, and strangely, off it as well. Off the field, the very future of international cricket was in jeopardy. 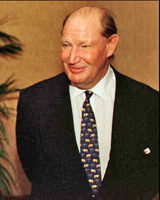 Kerry Packer, an Australian television magnate, made an unsuccessful bid to purchase exclusive telecast rights to all cricket matches in his country. He was informed by the Australian Cricket Board that they had already signed a deal with the state-owned Australian Broadcasting Corporation for a figure much' much lesser than what Packer had offered. Stung by this rebuttal, Packer organized a parallel world cricket body called World Series Cricket. He signed up the cream of the world's cricketing talent for his brand of cricket. The entire frontline Australian team of the era signed up, as did the entire frontline West Indies team. Then, some cricketers from England, Pakistan and South Africa with 'box office appeal' came on board. New Zealand and India apart, all the Test-playing nations of the era were affected by the defections. Bishan Bedi's Indians who landed in Australia in November 1977 for a five-Test series had a fantastic opportunity to win a series abroad against what was expected to be a second-string side. The Australian Board had banned all the Packer recruits from playing Test cricket, and recalled the 42 year-old Bob Simpson from retirement to lead a team of newcomers. Newcomers they were, but novices, the young Australians certainly weren't. India went into the first Test at Brisbane on a high, having won all the preceding three-day 'state' games. But Bedi's boys were made to struggle. They bowled out Australia for only 166 in the first innings, only to be dismissed for 153 in reply. Set a target of 341 in the fourth innings, India made a good fist of it. Gavaskar scored a solid 113 and laid the foundation for the chase, but the middle-order stuttered and some fine hitting and running by Kirmani and Bedi notwithstanding, India lost by 16 runs. The second Test at Perth was as close as the first. India managed scores of 402 and 330-9, and Australia were set a daunting 339 to win. An early wicket in the fading hours of the fourth day brightened India's chances of winning. But Tony Mann, who had come in as night-watchman on the fourth evening, launched a counterattack the next morning and guided his team to an exciting two-wicket win. Bedi bowled superbly and made the Australians fight for every run, but his team could not deliver the killer blow. India roared back with wins in the next two matches to square the series 2-2. B. Chandrasekhar took 12-104 in the third Test at Melbourne to secure a crushing win by 222 runs. The other hero of the Test was the Indian vice-captain Sunil Gavaskar, who completed his third hundred in as many Tests in the series. The first two had failed to win India the match, but the 118 at Melbourne reversed the trend. His mate Gundappa Vishwanath scored fifties in the third and fourth Tests. Chandrasekhar's 4-30 in the first innings of the fourth Test at Sydney ensured the end of the Australian innings for a paltry 131. The hosts were not allowed to come back into the match and India won by an innings and two runs. The 2-2 scoreline aroused a phenomenal amount of interest in the fifth and final Test. Suddenly traditional cricket had become as exciting as the hyped World Series Cricket, despite there being no 'stars' in the Australian ranks! 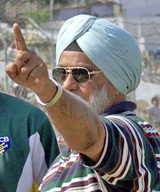 The Indians were high on confidence and Bedi was determined to become the first captain after Sir Don Bradman to win the last three Tests of a series after losing the first two. But a major disappointment awaited him and his team at Adelaide. For the first time in the series, the Indian spinners bowled poorly. Although Chandrasekhar took five wickets, he wasn't supported well by his colleagues, and Australia amassed 505 in the first innings. India managed only 269 in response with only Vishwanath and Vengsarkar contributing. Simpson did not enforce the follow-on, reasoning that facing the Indian spinners on a wearing wicket on the last day could be a tough ask. The Aussies were dismissed for 256 in their second innings, which meant that India needed 492 to win. Gavaskar was India's best bet to give his team a start. But the law of averages caught up with him, and he fell cheaply. The Indians fought hard. They kept building partnerships, some small, some big, but all important. However, the target was too stiff. When India were 348-6, it was anybody's game. The Indian lower order batted bravely and the Australians were a worried lot. The target was 65 runs away when a flourishing partnership between Kirmani and Ghavri was broken. Simpson's taking of the second new ball finally ended India's march, and the visitors fell short by 47 runs. Australia thus won the series 3-2. In playing all five Tests positively and aggressively, both Australia and India had proved that traditional cricket could have as much 'box-office' appeal as other 'unconventional' brands of the game.